Docker is an operating-system-level virtualization mainly intended for developers and sysadmins. Docker makes it easier to create and deploy applications in an isolated environment. A Dockerfile is a script that contains collections of commands and instructions that will be automatically executed in sequence in the docker environment for building a new docker image. In this tutorial, I will show you how to create your own docker image with a dockerfile. I will explain the dockerfile script in detail to enable you to build your own dockerfile scripts. A Linux Server - I will use Ubuntu 16.04 as the host machine, and Ubuntu 16.04 as the docker base image. A dockerfile is a script which contains a collection of dockerfile commands and operating system commands (ex: Linux commands). Before we create our first dockerfile, you should become familiar with the dockerfile command. The base image for building a new image. This command must be on top of the dockerfile. Optional, it contains the name of the maintainer of the image. Used to execute a command during the build process of the docker image. Copy a file from the host machine to the new docker image. There is an option to use an URL for the file, docker will then download that file to the destination directory. Used for executing commands when we build a new container from the docker image. Define the default command that will be executed when the container is running. This is directive for CMD command to be executed. Set the user or UID for the container created with the image. Enable access/linked directory between the container and the host machine. Now let's stat to create our first dockerfile. Login to your server and update the software repository. Docker has been installed and is running on the system. In this step, we will create a new directory for the dockerfile and define what we want to do with that dockerfile. Create a new directory and a new and empty dockerfile inside that directory. Next, define what we want to do with our new custom image. 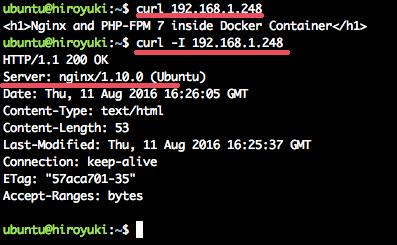 In this tutorial, I will install Nginx and PHP-FPM 7 using an Ubuntu 16.04 docker image. Additionally, we need Supervisord, so we can start Nginx and PHP-FPM 7 both in one command. On the top of the file, add a line with the base image (Ubuntu 16.04) that we want to use. Update the Ubuntu software repository inside the dockerfile with the 'RUN' command. Then install the applications that we need for the custom image. 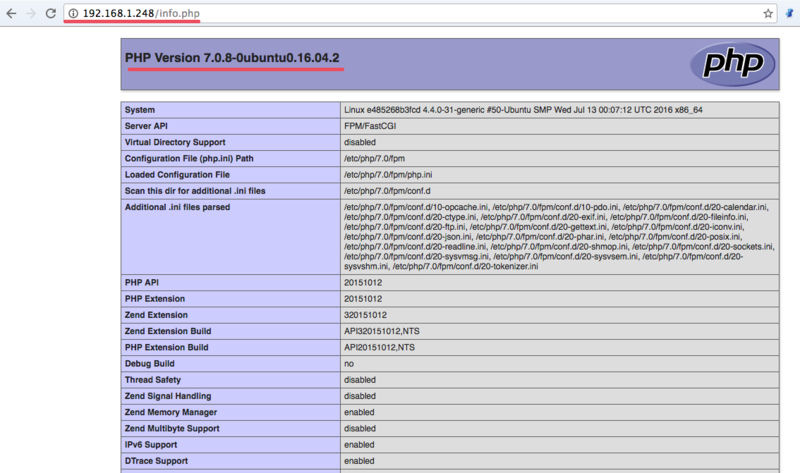 Install Nginx, PHP-FPM and Supervisord from the Ubuntu repository with apt. Add the RUN commands for Nginx and PHP-FPM installation. At this stage, all applications are installed and we need to configure them. We will configure Nginx for handling PHP applications by editing the default virtual host configuration. We can replace it our new configuration file, or we can edit the existing configuration file with the 'sed' command. In this tutorial, we will replace the default virtual host configuration with a new configuration by using the 'COPY' dockerfile command. Next, configure Supervisord for Nginx and PHP-FPM. We will replace the default Supervisord configuration with a new configuration by using the 'COPY' command. Now create a new directory for the php-fpm sock file and change the owner of the /var/www/html directory and PHP directory to www-data. Next, define the volume so we can mount the directories listed below to the host machine. Finally, setup the default container command 'CMD' and open the port for HTTP and HTTPS. We will create a new start.sh file for default 'CMD' command when container is starting. The file contains the 'supervisord' command, and we will copy the file to the new image with the 'COPY' dockerfile command. Now inside our 'Dockerfile' directory, create a new configuration file for the virtual host named 'default', a supervisord configuration file 'supervisord.conf' and a service configuration script 'start.sh'. docker build -t nginx_image . Then we can try to create a new container based on nginx_images. And before create new container, we can create new directory on the host machine for the webroot data. --name hakase nginx_image = We create a new container with the name 'hakase', based on docker image 'nginx_images'. -p 80:80 = hakase container running on port 80 on the host machine. -v /webroot:/var/www/html = /webroot directory on the host machine rewrite the /var/www/html directory on the container. The new container based on the nginx_image is running without error. Testing with curl command by accessing the host machine ip address. We will see results below. Next, test that PHP-FPM 7.0 is running by creating a new phpinfo file in the /webroot directory on the host machine. Now you can see the output of the phpinfo file. the new docker image 'nginx_image' has been successfully created, now we can create more containers based on that image. is there an alternative then doing vi on docker container ? I mean copy-paste of many configurations is troublesome job. In your dockerfile you have multiple volumes in the [VOLUME] section, doesn't this mean that you should be referencing this in the run command when you first run off of your built image. Does there need to be a -v for each of the items in [VOLUME] in the run command? If I follow your instruction verbatim. The two above commands do not work. Do you have to install nginx on the system? There is something missing with your instructions. Thanks a lot for sharing step by step and explained docuement. Nicely done article, What if I want to create multiple server blocks? How would that look in this configuration?